You also can set up HomeKit scenes that trigger automatically based on time of day and other factors. For instance, you can set up HomeKit automations that turn on the lights when you arrive home or dim them everyday at dusk. For people in the Apple ecosystem, HomeKit is a powerful, flexible and secure home-automation platform. Apple recently updated HomeKit to allow software authentication rather than requiring physical chips inside devices. This welcome change should bring far more HomeKit devices, since it makes it easier for manufacturers to make compatible products. That’s what happened with the Wemo WiFi Smart Dimmer. Previously, the smart switch required a separate Wemo Bridge to work with HomeKit. Wemo’s smart devices also work with Amazon Alexa and Google Assistant. 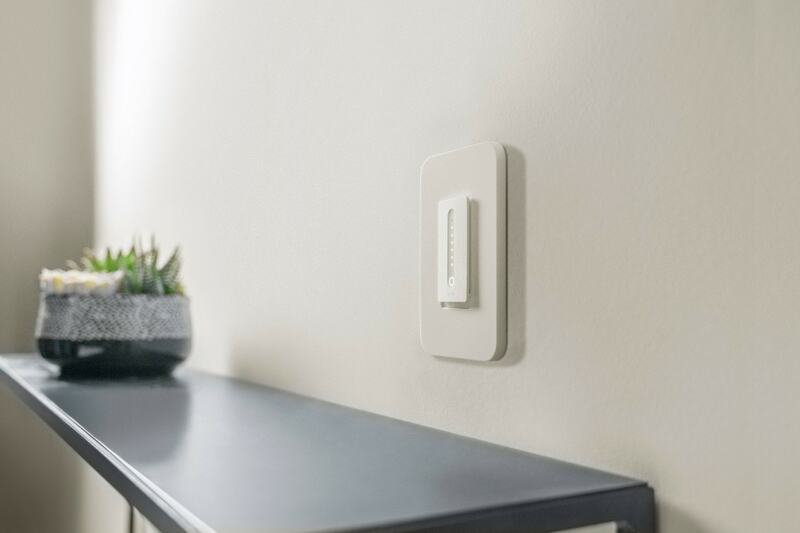 Like the excellent Lutron Caseta system, the Wemo dimmer must be installed in a wall like an ordinary “dumb” light switch. It’s easy enough if you have some basic home-maintenance skills. However, if you’re nervous about dealing with electricity, you might need to hire a pro. The Caseta requires a separate bridge to enable HomeKit compatibility, but works extraordinarily well. Another difference between the two: The Wemo dimmer does not work in three-way installations. The Caseta uses a separate remote to enable three-way functionality. The Wemo Mini Smart Plug, which lets you control lamps or anything else, also works with HomeKit (and without the Bridge). Wemo’s WiFi Smart Dimmer lists for $79.99. To use it, you must have a 2.4GHz 802.11b/g/n Wi-Fi router. When adding to existing 120-volt lighting installations, the dimmer replaces a single-pole switch. A neutral wire is required. Max wattage is 400 watts for incandescent single-gang installations, 250 watts for incandescent multi-gang installations and 150 watts for compact fluorescent/LED single or multi-gang installations. The Wemo app update rolling out today will walk owners through the firmware update, according to Belkin (which owns Wemo).